I have feared this day would come for some time. 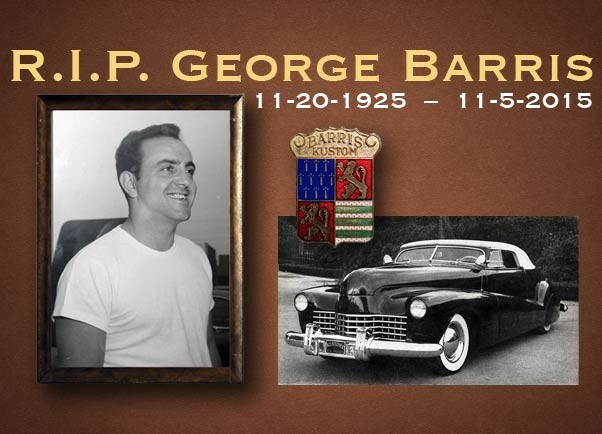 Our deepest sympathies go out to the Barris family and those close to George. Thank you George for your wonderful contributions to the world. You were an inspiration to a many, and you showed us the beauty of customizing. A sad day indeed. 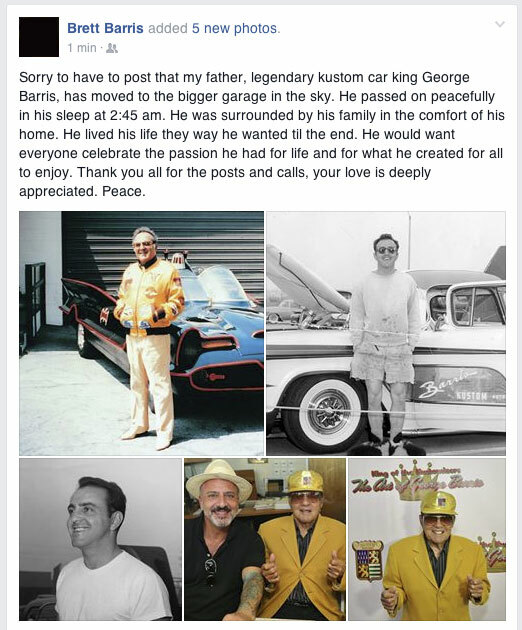 RIP Mr. Barris. I met Mr Barris a few times at various time but the first time I met him was the best. Detroit Autorama back in 1977 or so. Not exactly a great time to be a custom guy. I went to the show right from work wearing my shop clothes and smelling like lacquer paint. There was George at his booth with no one around him so we started to talk. I think that he dug the fact that here was a young guy who loved customs and knew about them. He was full of praise for the Detroit area custom guys from back in the day and said that he and Sam paid a lot of attention to what was coming out of the Detroit custom shops. 30 minutes later when he was signing his pic for me he asked my name. When I told him that it was Karl with a K he smiled and said “We like the letter K”. Wow, I am in shock right now. Several years ago George attended our club meeting (Burbank Road Kings) and gave a wonderful account of how life for the custom car guy was back in “the day”. As luck would have it, he sat next to me and I had a chance to talk to him one on one. He was very accommodating and signed some stuff for me and many other club members after the meeting. I feel for his family and all the custom car addicts around the world. We truly have lost one of the great ones who shares our love for custom cars. George and Sam lit the torch. The flame burns eternal. Tender mercies. R.I.P. George …. My condolences to the Barris family. 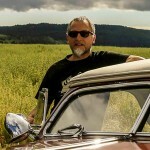 The King of Kustoms is dead , Rest in peace , my condolences to the family ! George Barris has influenced and inspired me with incredible craft , ingenuity and legacy of Kustom Kar design , the flame will live on in all of us ! Very sad day. We are certainly starting to see the end of an era and it is sad to see all these great men pass. RIP George! 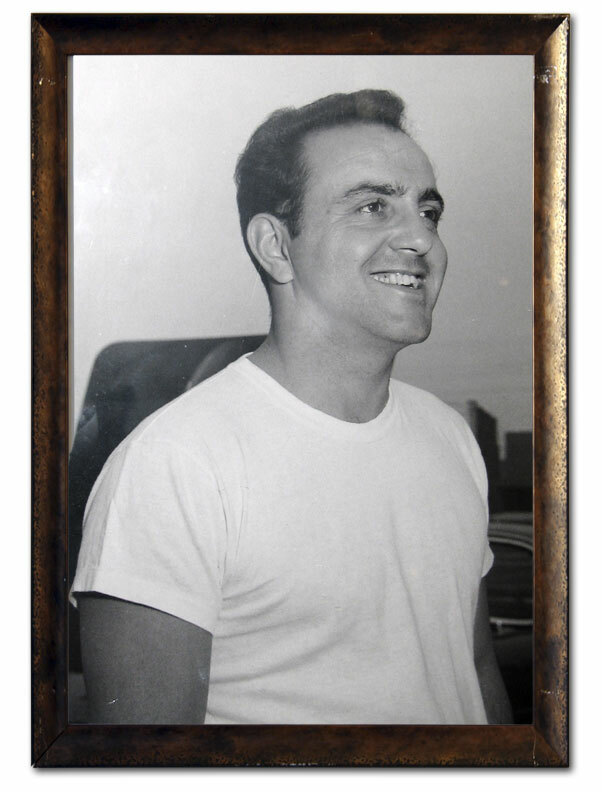 Geroge Barris you are every thing I admire , every thing I look up too , you guided me to follow my passion you were Harry Westergard’s apprentice you learnt from the best to become the best……. Every time I swing my hammer and bump my dolly and hear that sound only a car guy could love , I will remember who filled my soul with passion and you are the reason I love KUSTOM Cars…………..!!! THERE WILL NEVER BE ANOTHER…………….